The Rev. Karen Lyons, a vivacious pastor whose smile is an almost permanent fixture of her countenance, arrived at the United Methodist Church in Clarkston, Georgia, a little over a year ago to discover a challenge. Membership rolls stood at 200 for the church, but only 60 people made it to worship each week. Clarkston, an Atlanta suburb 20 minutes from downtown, has what Lyons calls “the most dense population of immigrants and refugees in the nation,” where the high school has students from more than 50 foreign countries and half the population hails from outside the United States, according to the city’s website. The diversity also created an opportunity for Lyons and the struggling congregation. Clarkston UMC rents its space to two other Protestant congregations, one African and the other Asian. It makes for a busy Sabbath, and “every year, Thanksgiving and Christmas, have a worship service together,” Lyons said. The cooperation between the congregations that meet in Lyons’ church may be unusual, but the demographics behind them aren’t. Millions of immigrants from countries around the world have come to the United States in recent years, and just as their presence in society influences everything from education to marketing, faith communities are also challenged by an influx of parishioners whose background, worship style and needs may be radically different. And observers say that immigrant population is reaching into American churches, synagogues, mosques and other worship centers. 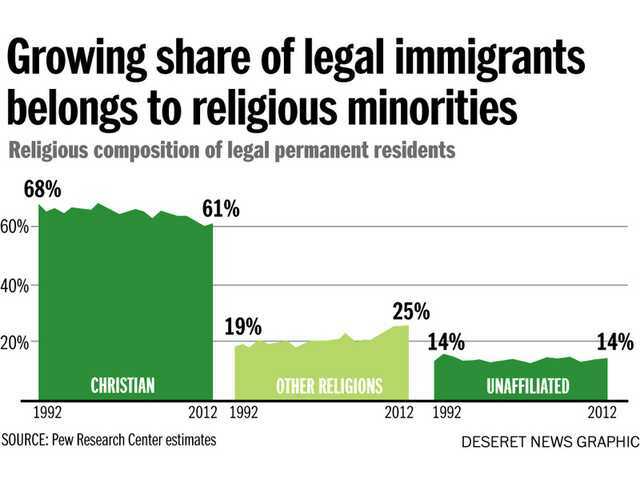 A 2013 Pew Research Center study found that 61 percent of immigrants are Christian. Such flows, from developing nations south of the equator to the more developed and affluent north, are “bringing together increasing numbers of diverse peoples into the conversation” of how congregations should function, Hanciles said. Even Islam is feeling the impact, said Abdullahi Ahmed An-Na’im, an Emory law professor and “an American Muslim immigrant for 20 years.” In his native Sudan, An-Na’im said, “I think religious experience always looks local and personal,” but when a diverse community of Muslim immigrants is found, worship needs to be adapted to fit the dominant culture. An-Na’im called this “the Christianization of Islam,” where the religion is framed in terms non-Muslims can understand, although this is not without its challenges since some traditions may be unfamiliar to Western sensibilities. As of 2012, an estimated 18.9 million U.S. immigrants were of Hispanic origin, the Migration Policy Institute reported. And for evangelical groups, said Tony Suarez, a pastor and vice president of chapters for the National Hispanic Christian Leadership Conference, this influx of new people presents a dual responsibility. One successful implementation, Suraez said, could be found at Houston’s Lakewood Church, where an estimated 46,000 people attend weekly. While most congregants are Anglos coming to hear Pastor Joel Osteen, the church also draws 10,000 Hispanics to Iglesia Lakewood, its Spanish-language congregation led by Danilo Montero. “I think that when you see the amount of immigrant communities that are coming, I can’t say they are doing enough, but they can realize this growth is not just in Miami, Houston or Los Angeles,” Suarez said. Of immigrants, “We’re everywhere,” Suarez said, citing a town 200 miles west of Minneapolis to support his point. The Asamblea Apostolica De Nuestro Senor Jesucristo (Apostolic Assembly of Our Lord Jesus Christ) is a 600-member church in Pelican Rapids, Minnesota, “one of the ‘whitest’ areas of the United States,” Suarez said. The congregation, made up of poultry workers from Mexico, began when the migrants found themselves in the area, organized Bible studies and eventually formed a church that built “a beautiful facility on their own,” he said. For at least the past 150 years, if not longer, the Roman Catholic Church has provided a focal point for many immigrant groups arriving in the “New World,” according to Sr. Myrna Tordillo, MSCS of the U.S. Conference of Catholic Bishops. Sister Tordillo is assistant director of the conference’s Subcommittee on Pastoral Care of Migrants, Refugees and Travelers. “When immigrants come into the local community and they look for a place of worship, they will go into a parish and see in addition to the sacraments and worshipping, there might be some things they would be asking or referred to,” she said. However, there is a challenge on the horizon: Many dioceses are closing and consolidating parishes. When those mergers involve people of different ethnic backgrounds, she said, priests and parish leaders need tools to help the blended congregations thrive, something the bishop’s conference is providing, she said. In response, An-Na’im mentioned the “centrality of migration in Islam, where the Prophet is the ultimate immigrant.” He said the Muslim calendar commences on the day of Muhammad’s migration (hijira) from Mecca to Medina.